Calgary is one of the best cities in the province of Canadian Alberta. It is located in the divergence of the Elbow River and the Bow River in the southern part of the province. The area has many prairies (an area which is filled with beautifully colored flowers and grasses) and foothills and is about fifty miles or eighty kilometers from the Canadian Rockies. This is the largest city in the Canadian Alberta and is considered to be one of the three largest municipalities. The Calgary’s economy is booming because of the energy and businesses, which are into financing. There is also a television and a film business, technology, tourism and logistics business. This leads the Calgary to build new communities, which are well known and splendid. 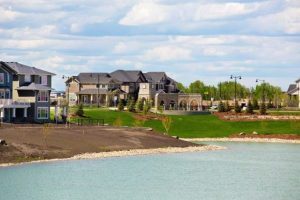 • Montrose This community is the winner of the “community of the year-Calgary region”. This is considered to be the most impressive neighborhood in High River. The place is like a dream where everything is well-planned by the extraordinary planners. The place will show you the best of the nature and offers you anything that you are looking for. The place is surrounding a pond which runs up to 16 acre which provides a fresher wind within the community. The people living can also enjoy the new features, which is the pergola. The staffs are doing its best to improve the place and this includes the future bungalows and townhouses. See the Christmas Parade in Legacy ! • EvansRidge This is the pioneer dream community in North Calgary. The place will offer many choices for the home, which includes condos, and starter homes up to the VIP ridge lots. This is a place conducive for the whole family because the place is well situated. The community has a playground for the younger kids, school for the students and a small field for soccer. There is a shopping center for the whole family and a quiet place for those who are looking for some peaceful time. • Castle Keep This is a community which shows off the Dream’s background in the quest of getting amazing lands and in working with professional and well-known builders. This is located in an out of the way hillside in Calgary (western Calgary) and is covered by the old trees and a striking view of the neighboring mountains. Castle Keep is very exclusive that the residents will need to pass a high-security entrance and the community will only need one hundred and thirty six (136) European-inspired townhouses and one hundred fourteen (114) family homes. • Richmond Hill This is located on the southern part of the Signal Hill and the development started on the early nineties. This place is composed only of townhouses, condos, apartments and villas. This place also offers you a striking view of Nature as it faces the striking Elbow Valley and the Canadian’s Mountain Rockies. The community has school, playground and shopping centers. These places are well planned and designed and are considered a realization of dreams.